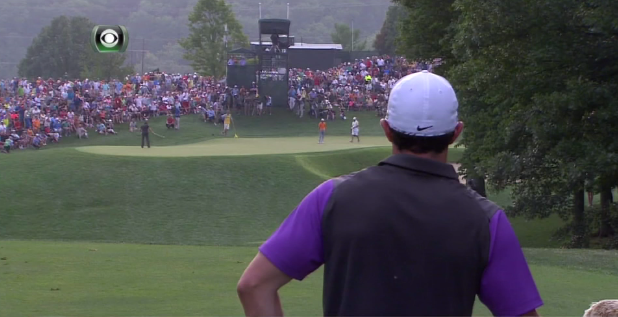 Rory watches the Mickelson/Fowler group. That was fun, wasn’t it? After three pretty lacklustre majors from an excitement standpoint, the weekend at Valhalla was incredible, especially on Sunday when it seemed like after the rain delay, we had non-stop action for six hours. This one’s going to be tough to top. Padraig Harrington does the Happy Gilmore swing at the Long Drive Contest. Putt of the week from club pro Johan Kok. Ryan Palmer, #TourSauce part one. Ryan Palmer, #TourSauce part two. Tiger didn’t have the best week. He did hit this putt on the practice green though. Rain was a factor all week. 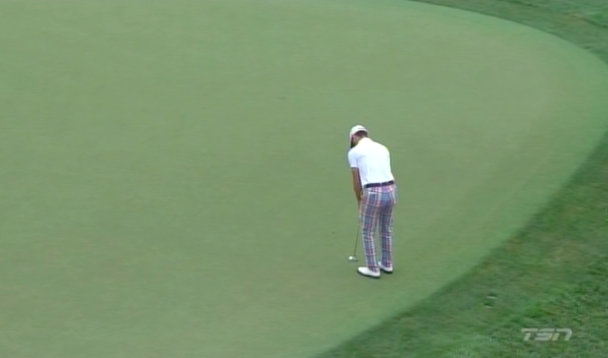 Ian Poulter chips while on the green, and well, that isn’t good. It wasn’t all good for Rory. Rory’s woods were incredible. Approach into 7 on Friday. The adventures of Jason Day. Billy also wore these on Friday. Bernd Wiesberger was the story on Saturday. Unlucky break for Thorbjorn Olesen. Henrik Stenson, praying that this thing never ends. Incredible drainage on Sunday. 20 minute difference on the sixth. Rory gives his dad a hug.